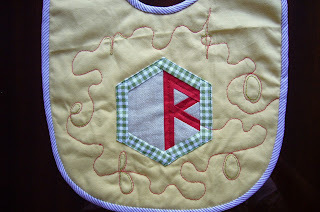 The nice hexie letter R I have written about some days ago was the beginning of this little project. Some months ago my Italian friend Elisa from Dilana&Dilino-Creazioni-Patchwork has a baby. I want to make a special gift for the baby - little Roberto. 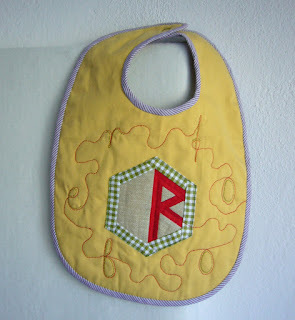 I want to try my new pattern Hexie alphabet and choose to make letter R and apploque on this bib. Especially like the idea for quilting. Do you remember this game when there are written letters on a sheet and you have to connect them to have a whole word? I write the letters of the name R-o-b-e-r-t-o using first paper pieced R and FMQ for the next letters. Then add bias binding and stitched by hand. I had to be very careful at the curves to keep the shape. My friend Elisa is a perfect quilter,so I have to be precise. At the end I embroidered the letters with another color to make the name more visible. I sent the bib and began waiting for the answer. Do you think Elisa liked it? The answer came yesterday - lovely picture of Roberto wearing the new bib. I am happy having such friends. Oh, excuse me for the analogy. Here come the Hexie Numbers. 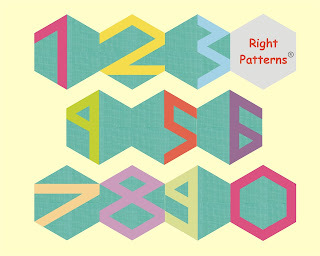 After designing the hexie Alphabet I have to add the numbers. There is almost a month to beginning of school year. 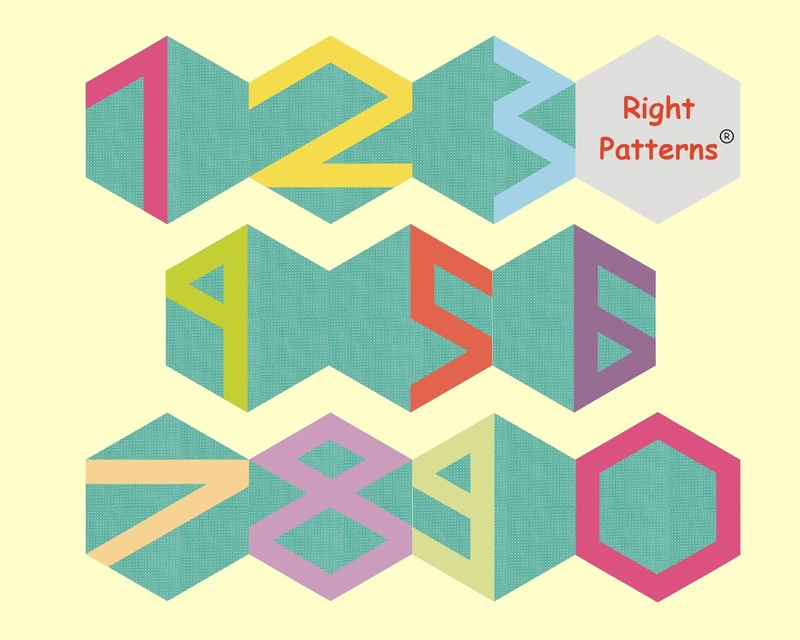 Time is enough to make a beautiful quilt with hexagon letters and numbers. The project is great for beginners - only 2 of the letters and one number have 2 sections. 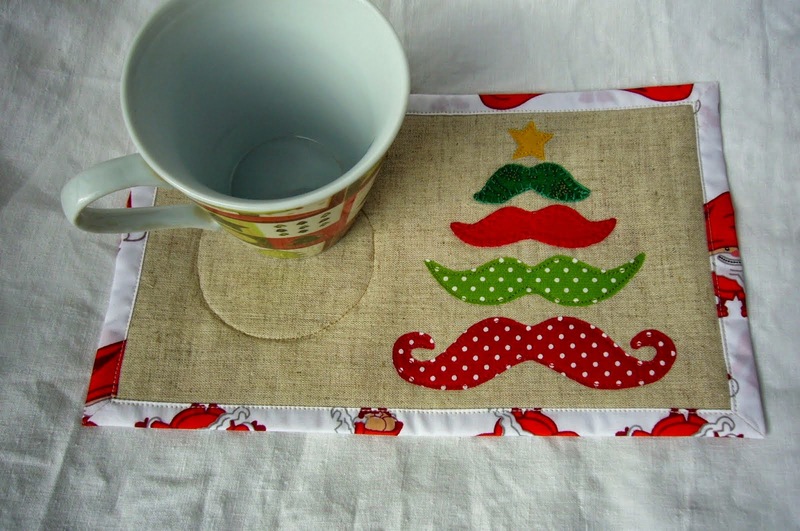 What does it means - easy ans fast sewing.